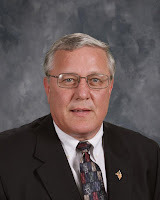 After being selected to fill the vacancy left by former Grandview School Board member Rachel Casey in 2013 and serving five years, President WayneTerpstra has submitted his resignation. According to Terpstra, a change in jobs and more travel on his schedule to help grow the company he works for led to his departure. With Terpstra’s resignation, the Grandview Board of Education reorganized at their October 19 meeting. Leonard Greene will now serve as President and Ron Haley as Vice President. Terpstra’s unexpired term lasts through the next Board of Education election on April 3, 2018. Current board members will interview interested candidates who apply for the position. Terpstra said that he’d like to see someone from the community who has the time to be active and involved in the district step up to fill the vacancy. Interested applicants for the vacancy should submit a letter of intent to be considered for the available Board of Education position by November 17. Guidelines for the vacancy position are on page 2 of the print edition. Hard work, dedication and a few tears paid off for one South Kansas City woman this past weekend. The culmination of research and interviews with locals came to fruition as Diane Euston, a local high school teacher and avid historian, along with members of the National Society of the Daughters of the American Revolution (NSDAR) Little Blue River Chapter and the Historical Society of New Santa Fe, held a homecoming ceremony for a former South Kansas City church. 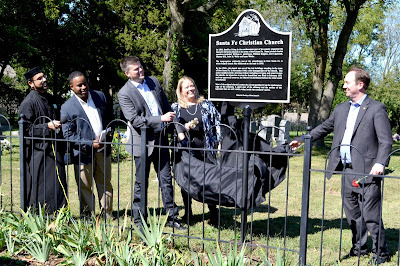 On Saturday, October 7, the Santa Fe Christian Church received a permanent marker dedicated to the education of visitors to the area about the history of the landmark lost. Euston provided the history of the church to roughly 150 visitors who attended the ceremony. In 1869, members of the Bethlehem Church of Christ organized a new congregation. The church organizers believed that the church community needed a burial ground for their loved ones, and in 1885, the New Santa Fe Cemetery was established. An adjacent lot was used for building the church. The Christian Church at New Santa Fe (later shortened to the Santa Fe Christian Church) was dedicated in 1892, and thrived through the years due to the hard work of the pioneer community. Euston added that the church was a gathering place for the community. As the area changed from a farming community to suburbs of Kansas City, the Santa Fe Christian Church welcomed new members. 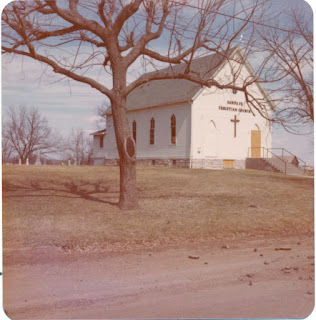 In 1965, a group of men with no attachment to the pioneer families legally incorporated the name Santa Fe Christian Church out of a home in Grandview. On November 14, 1969, at approximately 7 p.m., a fire started in a defective heating system, damaging the north side of the historic church. The fire chief stated that the structure was not severely affected and that the church could be restored to its former glory. “It became clear, very clear, that not everyone was willing to save the little Santa Fe Christian Church,” said Euston. 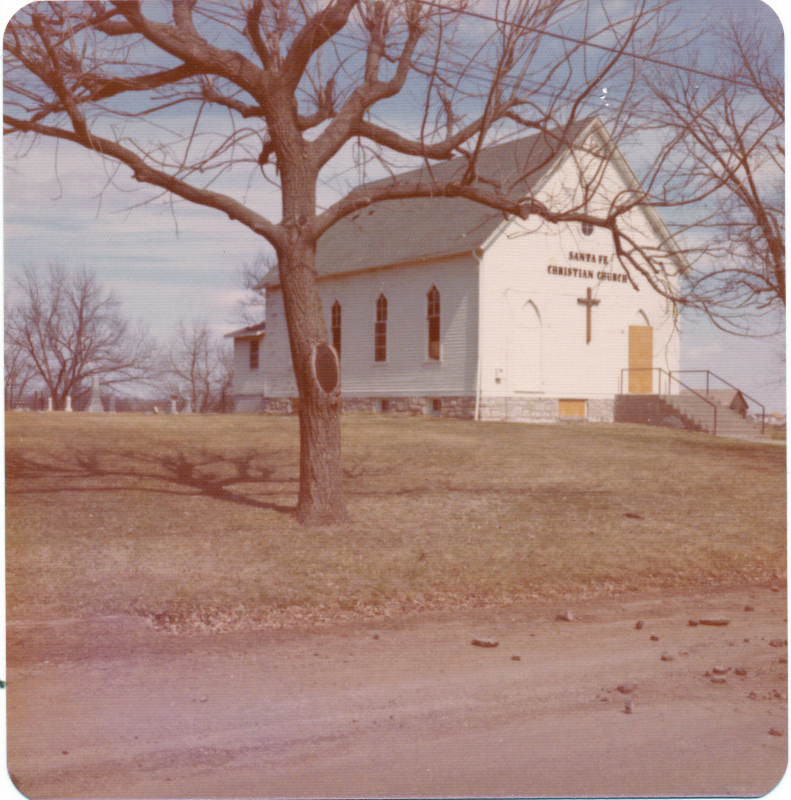 In the spring of 1970, a secret vote was held to raze the church, and a restoration committee was quickly formed to prevent that from happening. The committee determined that if the funding was available to make the repairs to the church, there was no reason to destroy it, and they worked to raise money to save the building. The restoration committee met with the trustees of the church to try and reason with them. According to Euston, one stated that the building would always smell like smoke, while another stated he was looking toward the future, not the past. In October of 1970, three trustees of the Christian Church at New Santa Fe signed a special warranty deed that dissolved the former organization. All legal rights were then given to the Santa Fe Christian Church, the same church organized in Grandview in 1965. One of the members said during a deposition that he believed what he was signing was simply a release of trusteeship. Estimates to fix the damage to the church were between $3000 and $10,000. Insurance paid the church over $20,000, and that money was in control of the new organization. Instead of repairing the old church, they bought the lot next door for $7000 and began construction on a new church. Meanwhile, funds were still being raised to help restore the damaged building by the restoration committee. On February 7, 1971, they met with the new leadership to plead their case one last time to allow their church to be restored with private funds. The restoration committee and their supporters tried to vote, but were not allowed because they hadn’t been active members of the new church for at least 90 days. The vote proceeded without them and in the end, 17 out of 20 members voted to raise the church. On February 12, a restraining order was filed against the Santa Fe Christian Church to stop demolition. The next day, February 13, 1971, Judge Richard Sprinkle signed the filed restraining order and at 10:36 a.m., the injunction became official; the Santa Fe Christian Church was to not be touched or destroyed. However, at approximately 9:30 a.m. that same day, demolition of the Santa Fe Christian Church had already started. The restoration committee wasn’t going to give up their fight, and filed suit against the new church. A resolution was found four years later with the creation of the New Santa Fe Cemetery Association. The small burial ground was all that was left of the community, and it became their mission to save it from the new organization. A common theme for the month of October for the Santa Fe Christian Church was homecoming celebrations. An annual homecoming service was held, drawing a large crowd of former members and friends of the church and provided fellowship for the entire community. Approximately two years to the day after the church was bulldozed, the Little Blue River Chapter NSDAR was being organized in Grandview. It would take another 42 years for the New Santa Fe Historical Society and the local NSDAR chapter to come together to apply for a special grant project to celebrate the historical value of the church that once stood on the grounds of New Santa Fe. “Little Blue River, in 40 years, had never tackled anything like that before,” said Margo Aldridge, Regent with the Little Blue River NSDAR. In 2015, Aldridge contacted Trailside Center volunteer Ann O’Hare to see if she knew of any local projects that needed funding. The project received $1844 in an education grant from DAR and was sponsored by the local chapter. The project was originally submitted in 2015, and after being turned down the group resubmitted in 2016. They were notified in March of this year that the Santa Fe Christian Church dedication was approved for funding. The final homecoming for the former members of the Santa Fe Christian Church revealed a permanent marker dedicated to its memory. Should the former Rodeway Inn motel building, which has been deemed a public nuisance, be demolished or allowed to be repaired? That was the question during the Grandview Board of Aldermen’s administrative hearing concerning the property last Tuesday, September 26. According to the hearing’s background report, the building at 15201 South US 71 Highway was subject to a high-wind event on December 31, 2011, and sustained damage to the flat roof of the motel. As a result of the damage, the motel was vacated due to interior water leaks. The property owner at that time filed claims with his insurance carrier so that repairs could be made. The owner engaged the services of a structural engineer to develop plans for the roof replacement and worked with the City to have a new, sloped roof constructed and installed over the existing flat roof. The second phase of the repair and remodel for the Rodeway Inn motel concentrated on the demolition of the interior to provide rooms that met the needs of today's lodgers. The property owner utilized several contractors on the demolition portion of the work with very few issues. The remodel project started to bog down in 2014 when permits were pulled, very litte work was completed and communications with the property owner dropped off significantly. In August 2014, the City received notification that the property owner had declared bankruptcy. During this process, no work was completed on the structure. The bankruptcy process was completed in 2016. City staff had some meetings with the commercial real estate professionals about the property as they prepared to market it to potential buyers. In May 2017, the property was purchased from the lender. The property was purchased in July 2017 by an entity called RW1 LLC. RW1 LLC, according to its corporate filing with the Missouri Secretary of State, has two owners, Charles Soucek and James Woodley. Shortly after taking ownership, large quantities of materials were brought on to the site by Soucek, with the intent to have a flea market. City staff, including the Building Official, Building Inspector and Fire Marshal, completed a comprehensive inspection of the property. The composition of materials brought on to the site was cause for concern by the City. In addition, Soucek made little effort to clean up the property or to hire the required professionals to develop plans for the continued remodel of the former motel so that it could be re-opened as a motel or demolished and removed to make way for another allowable use. The purpose of the hearing was to allow the owner of the building to show cause as to why the building should not be declared a nuisance detrimental to the health, safety or welfare of the community. However, if such findings were made, the building would be ordered to be demolished or repaired. Joe Gall, an attorney for the City of Grandview for the purposes of the administrative hearing, asked to testify first to provide the Board of Aldermen with some background on the property’s ownership before offering a recommendation. While paperwork filed for the LLC show Soucek as the registered agent, according to Gall, the organizer was Woodley. Gall said that the registered agent, Soucek, was attempted to be served notice of the hearing, however, Soucek died on September 1, after sustaining injuries in a car accident on August 31. The notice of nuisance, sent to Soucek, was signed by his daughter, Susan Miller. Another notice of the public hearing, dated August 28, directed to Soucek was also signed by his daughter, Susan Miller, on September 1, the day that Soucek died. “I have a bit of discomfort about the validity of the service of this notice of hearing on the registered agent of RW1 LLC,” said Gall. Miller, who attended the hearing to speak on her father’s behalf, stated that her mother has Alzheimer’s; and because she needs round-the-clock care, she was in her parents’ residence and signed for the notices addressed to her father. After his death, Soucek’s assets have gone into a trust, with Miller now serving as the successor trustee due to her mother’s health. The property, the former Rodeway Inn, will eventually end up as an asset in that trust. Gall recommended that, due to the complicated ownership issues with the property that will likely change, the hearing be continued to allow those issues to solidify before returning to look deeper into the evidence on the condition of the building. “We need to come back and ensure that the proper parties have been given notice and they have the opportunity to appear,” said Gall. Ultimately, the Board of Aldermen unanimously supported Gall’s recommendation to continue the hearing until Tuesday, October 24, providing Miller opportunity to clean up some of the material on the property that was a cause for concern before the hearing to determine whether the property should be demolished or repaired. Typically, when students are out of school for district in-service, their teachers spend the day in meetings, talking curriculum and learning new ways of instruction. However, last Friday, teachers in the Grandview School District participated in a visual representation of privilege among their peers and how that affects their teaching. 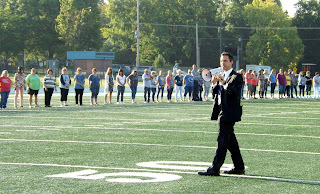 Superintendent Dr. Kenny Rodrequez invited every certified staff member onto the Grandview High School football field for a privilege walk. 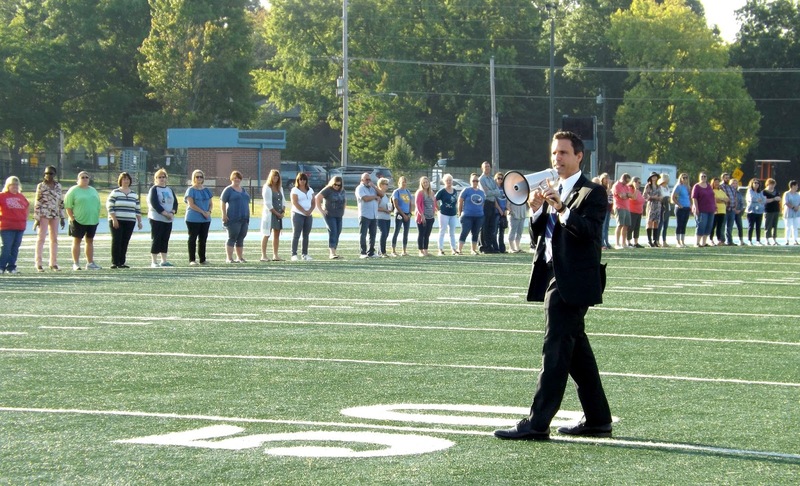 Teachers lined up evenly, and Rodrequez read a series of statements, asking that each person take a step forward or backward if each statement were true in their lives. Eventually, the educators were no longer even in their line. Some took several steps forward, some took several steps back, while others remained on the line where they started. The end result was a look into how instances in a person’s life which cannot be controlled often relay into how they perceive the world around them. He went on to say that life experiences have an impact on decisions that teachers make, the way they teach and the way relationships are built with their students. “With all the things that we have in common, we still have a lot of differences,” said Rodrequez. The exercise was part of the district administration’s focus on cultural competency to better relate to students and families. The activity led to conversations regarding unconscious bias and trauma. Rodrequez said that if the exercise was done with the students in the district, the outcome would have looked very similar. Several Grandview educators felt uncomfortable throughout the demonstration; some were emotional afterward. “It was truly an eye-opening exercise that showcased how each of us comes from a different background with different experiences,” said Grandview High School teacher Diane Euston. After the privilege walk, district teachers reflected on what they felt and how they can use their own experiences to better connect with students and their families.